Arrival on Leh Airport you will be transferred to your Hotel. There will be no activity on your arrival day, as it is recommended that tourists relax and undergo minimal exertion to enable them to get acclimatized to the rarified oxygen level in this high-altitude region in the high Himalayan plateau. After Breakfast leave visit Hall of Fame, Gurudwara Pathar Sahib, Magnetic Hill & Sangam View where Indus & Zanskar River meet. Drive back to leh. Afternoon visit to Shanti Stupa & Leh palace. Shanti Stupa : Located on the hilltop at Changspa. The Stupa was constructed by a Japanese Buddhist organization, known as ʹThe Japanese for World Peaceʹ. The aim behind the construction of the Stupa was to commemorate 2500 years of Buddhism and to promote World Peace.. Leh Palace: Built in the 17th century, it was built as the residential palace for the King Singge Namgyal. Much smaller but resembling the Potala in Lhasa, Leh Palace is now in ruins. It has nine storeys and has been deserted since the royal family shifted to the Stok Palace in 1830s. nine storey, but it is now dilapidated anddeserted. It was the home of the royal family until they were exiled to Stok in the 1830s. Dinner & Overnight stay at hotel in Leh. Leave early morning to Pangong Lake through Changla pass 5486 Mtrs. While ascending Changla pass 5486 Mtrs. Enjoy the beautiful panoramic view of the villages below the pass. After crossing the pass halt for picnic lunch at Tsoltak, the summer pastureland of the yaks. Arrive Durbuk and from there a short drive takes you to the western shore of the lake. Enjoy the landscape in the back drop of the Lake. This famous blue brackish Lake of Pangong is 5/6 Kms wide and over 144 Kms long with half of it’s running the other side of the "INDO CHINA BORDER". One rarely feels so close to nature and environment and the scenery is unforgettable. Dinner & Overnight stay at hotel / Camps in Pangong. After an early breakfast we drive to NUBRA VALLEY leads through KHARDUNG-LA the highest motorable road in the world at 18,390 ft, around 39kms from Leh. Nubra Valley is popularly known as Ldorma or the valley of flowers. It is situated to the North of Ladakh between the Karakoram and Ladakh ranges of the Himalayas. Afternoon visit to Hunder Monastery, Hunder is one of the remote villages in the Ladakh district of India's northernmost State of Jammu and Kashmir (Kashmir). Lying close to the border between India and Pakistan in the north-western part of Ladakh, the village of Hunder comprises settlers that include Ladakhis and Tibetans. Visit SAND DUNES to enjoy a camel safari (Optional on direct payment basis). Dinner & Overnight stay at hotel / Camps in Nubra Valley . 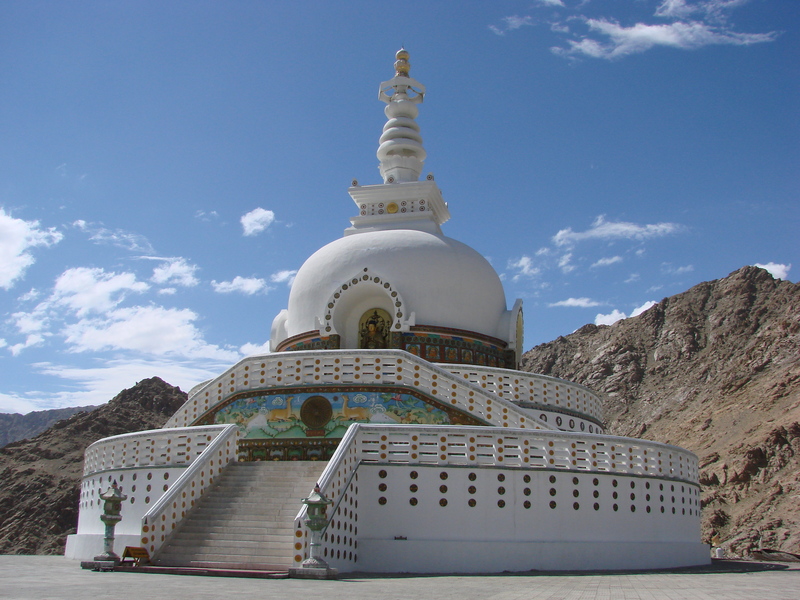 After your breakfast at the camp, visit to Diskit Monastery en route to Leh. The Diskit Gompa of Leh Ladakh dates back to the 14th century and owes its inception to Changzem Tserab Zangpo, a disciple of Tsong-kha-pa. At the heart of Diskit Monastery is an elevated cupola, which stands adorned with a beautiful fresco that illustrates the Tashilhunpo Gompa of Tibet. There are a number of shrines inside the monastery's complex, like Kangyu-lang, Tsangyu-lang, etc. Also, hundreds of Mongolian and Tibetan texts have found their storehouse inside these temples. Diskit Gompa has quite an interesting legend attached to it. It is believed that a Mongol demon once lived here and was considered to be a sworn enemy of Buddhism. Afternoon rest and relax or take a walk to the local market. Dinner & Overnight stay at hotel in Leh.